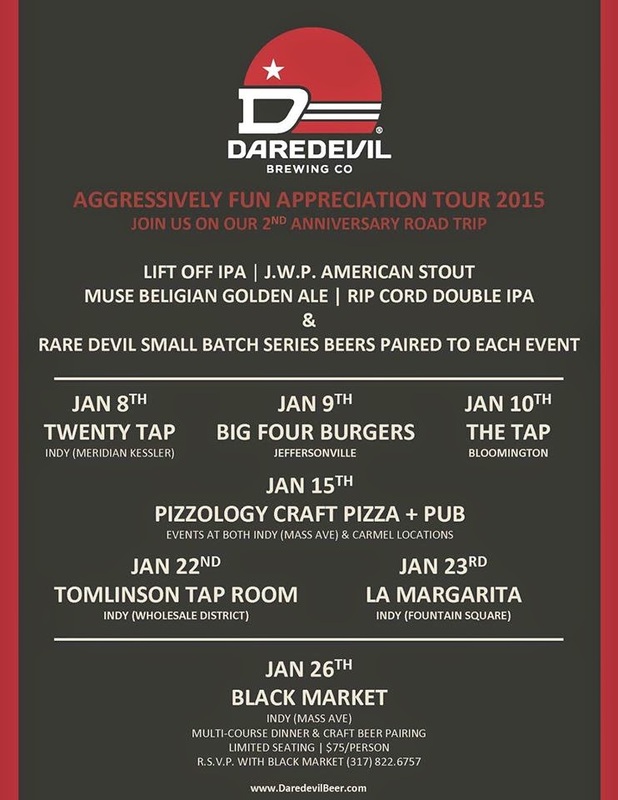 The first of a few tap takeover / anniversary parties for Daredevil took place last week at 20 tap. Since the brewery is still being built they are doing what they did last year and hosting multiple parties celebrating 2 years here in Indiana. Hosting multiple parties allows their fans from all over Indiana to celebrate with them and try some great brews. This month of parting comes to a close with a beer dinner at Black Market. If you didn't go last year, you need to check it out. The food was just as awesome as the beers were. Last year Daredevil released a few limited release beers that they called Rare Devil beers. These were their standard brews aged on different fruits and other tasty flavors. This year they've taken a little more classic approach and aged 2 of my favorite beers, JWP stout and Muse Belgian, in Rye whiskey barrels. I talked with Shane from the Daredevil team at the release and he said that they chose rye barrels because they didn't want as much sweetness as the bourbon barrels are known for. It's also a great mix because the standard JWP stout has rye in the malt bill already. The spicy whiskey flavor blended great with both beers. Barrel Aged JWP was aged for 13 months. Normally JWP is a pretty hopped up American stout. The hops compliment the roastiness of the malts and the spicy rye flavor well. The barrel aged version has been aged long enough that a lot of the hop character had fallen off. I was worried this would make the beer unbalanced. It's hard to know what a barrel will do before you put the beer on, so it can be a bit of crapshoot. This gamble paid off. Although the hops were significantly lighter the barrel characteristics made up for it and balanced everything out nicely. The roast of the malt was still right there but the barrel added a little bit of sweet vanilla and oak flavor that was balanced out with a bit of spicy rye whiskey. The rye accentuated the rye in the malt bill and made it significantly more forward. This beer packs a ton of flavor for a beer under 10% ABV. The balance is absolutely fantastic. Barrel Aged Muse might have been the most impressive part of the evening. Muse is a great Belgian beer. It is a big golden beer with some delicious fruit flavors. Thick white head released all sorts of delicious fruity aromas. The head followed all the way to the bottom of the glass with stick lacing hugging the sides. It has great traditional flavor with a rich golden color. The barrel did a good job of balancing out the sweetness of the beer. It added a bit of vanilla and oak that came off like a coconut. The yeast flavors turned into an almost pineapple tropical fruit flavor that added a great direction to the standard Muse. These two beers will be at all of the Daredevil parties except the Pizzology events. If you like the standard versions you need to make your way out to one of these tap takeovers. The BA versions won't disappoint. If I haven't sold you on the Black Market event yet, there will be a couple Rare Devil beers that will only be at the dinner and maybe Winterfest if I don't drink them all. Congratulations again to Daredevil on your anniversary. The beers were awesome, and I can't wait to see what you bring to town when the brewery is up for real. Thanks for the write up. We will continue to do our anniversary tour in the future even after the new Speedway brewery and tap room opens. It's all about saying thank you to the people that enjoy our beers all year long. We enjoy taking out some of our small batch Rare Devil beers and having a blow out tap takeover where we get to meet people. Cheers.